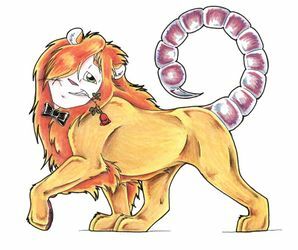 The Romanticore is a manticore monster that has become so lonely it has decided to act romantically to any moving creature. Unfortunately, most creatures, and especially heroes, find this disturbing and reject the Romanticore sending it into a blind fury. At some points during a fight, a Romanticore may even try to calm down and do something romantic towards its enemy. However, that usually only makes the enemy sick with disgust and yet, oddly flattered. The Romanticore's body has flaming red hair and lots of grotesquely large muscles. If you ever want to tick off a Romanticore, call it fat and unattractive. That though may result in you losing a leg or another vital body part. The Romanticore is an extremely dirty fighter when angry which means certain death to any hero who boldly ventures too far in the name-calling.